* Track mutual funds, ETFs, and major stock indices. * Research and monitor important stock details, and analyze valuable investment fundamentals, such as RoA, RoE, operating cashflow and free cashflow. * Real-time cryptocurrency quotes in over 200 currency pairs, directly sourced from more than 75 individual exchanges, including Coinbase, Gdax, Kraken, Bitfinex, Gemini, Bitstamp, BitThumb, Poloniex, and others! 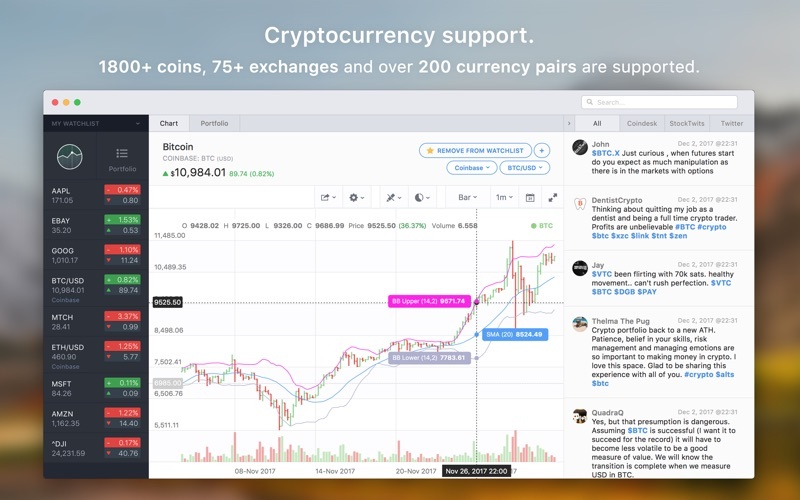 * Support for more than 1800 cryptocurrencies, including Bitcoin, Ethereum, Litecoin, Neo, Dash, Ripple, Monero, Bitcoin Cash and Gold, IOTA, Cardano, OmiseGo, and many many more! * An advanced and powerful, yet simple to use chart. * Extensive support for technical analysis. Draw customized trend lines. * Zoom in on any area of the chart you find relevant. 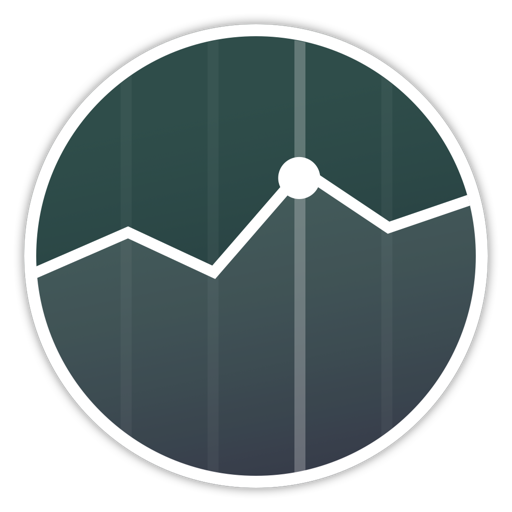 * Support for different charting modes: area, line, candlestick and bars. * Pick the theme that works best for your investment or trading set up: light, dark, improved contrast. 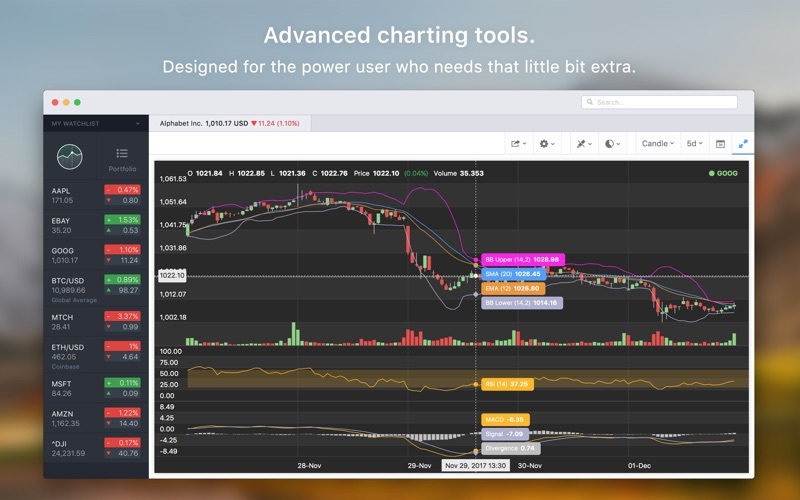 * Easily share your chart and annotations with your fellow traders with a single click, or save the chart to disk. 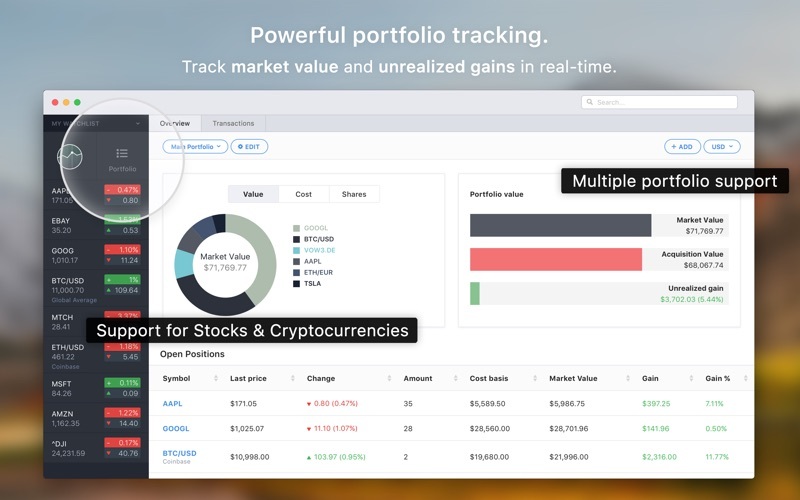 * Watchlists allow you to monitor in realtime the stocks and cryptocurrencies you own, or intend to buy. * Divide your holdings in one or multiple portfolios. * Receive a visual overview of the composition and weighting of your portfolio, and its entire overall gain or loss. * Get a detailed overview of your current positions, plus both the gains and losses on those positions. * Direct integration with various news sources to fetch relevant news data. 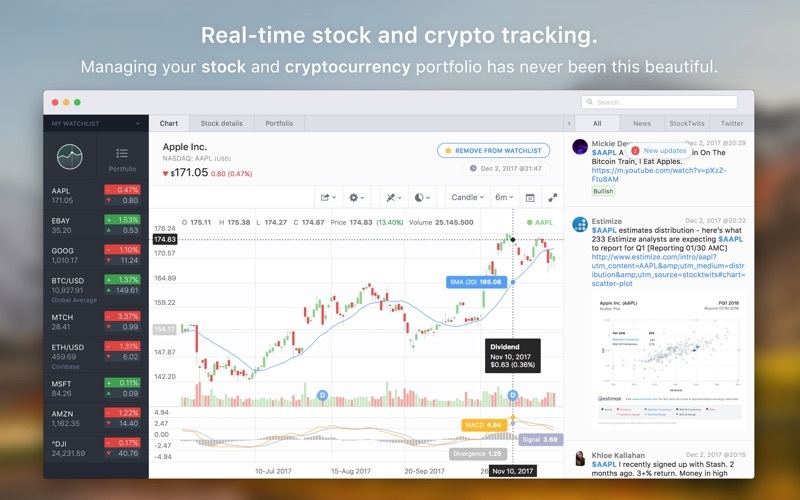 * See what other investors are saying about your favorite stock or cryptocurrency through integration with Stocktwits and Twitter. 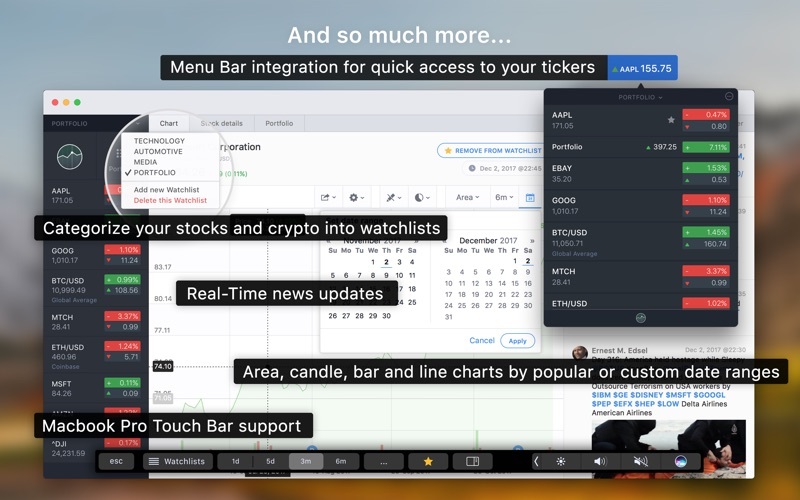 * Quick access to your stocks and cryptocurrencies from anywhere on your Mac. We currently do not support connecting directly to your brokerage account to trade securities from within the app. It is something we are working on, though! Have an issue or discovered a crash? Seeing something you don’t like? Do you have some feedback? Let us know at [email protected] and we’ll take a look! We are constantly updating our app. App issues will be fixed and your received suggestions might pop up in one of our next updates.